For the first time in six years, the actual feast day of the Cathedral’s Patron, Saint Steven the First-crowned/Simon the Monk (October 7), fell on a Sunday and added a special touch to an already special day in the life of this parish community. The feast day began, as it always does in the Church, with Vespers the prior evening; His Grace, our Bishop Maxim, was in attendance in anticipation of also leading us in celebrating the Divine Liturgy the following morning. 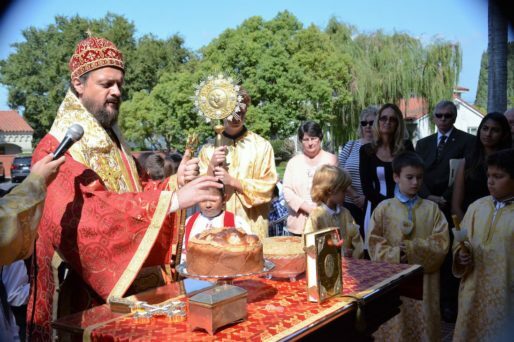 That sun-drenched morning marked the seventy-second anniversary of Saint Steven’s Serbian Orthodox Cathedral in Alhambra, California. It began with Resurrectional Matins and near its conclusion, Bishop Maxim was vested and the Liturgy then followed with Cathedral clergy Fr. Nicholas Ceko and Fr. Norman Kosanovich, along with the Bishop’s Deacon, Vladan Radovanovic, and responses sung by our Cathedral Choir. At the conclusion of the Liturgy, the entire congregation went in procession around our blessed church building, stopping to offer memorial prayers for the departed who have reposed in the Lord, including the departed bishops, priests and faithful membersand benefactors of our parish, especially Bishop Gregory, Metropolitan Christopher, Bishop Sava, Protopresbyter Vladimir and Protica Bosiljka Mrvichin, Protopresbyter Ilija Dajkovich and the newly-departed Protopresbyter Dragoljub Dennis Pavichevich. As the procession continued, blessings and prayers for the parish family and the surrounding cities of Greater Los Angeles were offered. On the front steps of the church, the Bishop blessed the festal bread and three generations of the parish faithful stood by him as the honored Kumovi for 2018: Slobodan and Divna Dobrilovic, Nick Savich from the Young Adult Fellowship, and high school student Ana Krstic. The final and unexpected part of the program was a memorial prayer and singing of “Memory Eternal” led by Fr. Nick as he announced the passing that very morning of his predecessor, the previous Cathedral Dean (1982-92), +Fr. Dragoljub Dennis Pavichevich. With faith in the Resurrection, and thoughts that the parish’s 75th Diamond Anniversary is only three years away, the 2018 celebration of Saint Steven’s Day drew to a prayerful close.